If you have ever wondered a way to reach from one point to the other, that would include walking, public transportation and/or flights? And how much it may cost, then Rome2Rio is your one-stop place. The website offers a multi-modal, door-to-door travel search engine that returns itineraries which may include air, train, coach, ferry, mass transit and driving options to and from any location. It also gives some extra information in terms of total time, flight times, flight costs (if you provide dates of travel), and a detailed carbon assessment of your journey with some more information on how you can offset it. For example, we gave an address in California to an address in São Paulo, Brazil; and the results were quite impressive, as yous see in the image below. You can click on individual steps and get detailed data and information on your routes, alternate routes and flight prices. 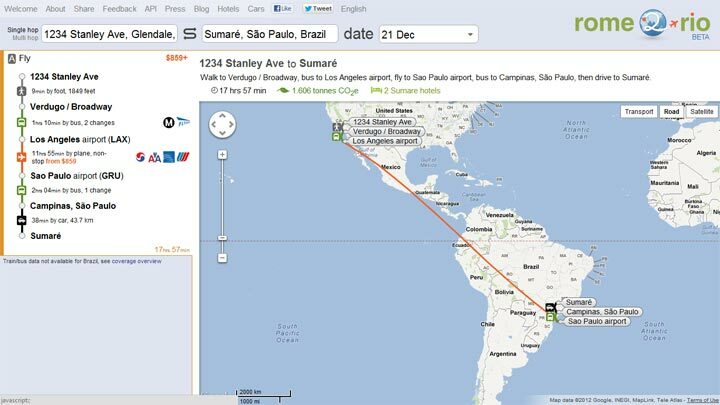 The website pulls data from Google Maps for routes and Kayak for estimated flight costs.